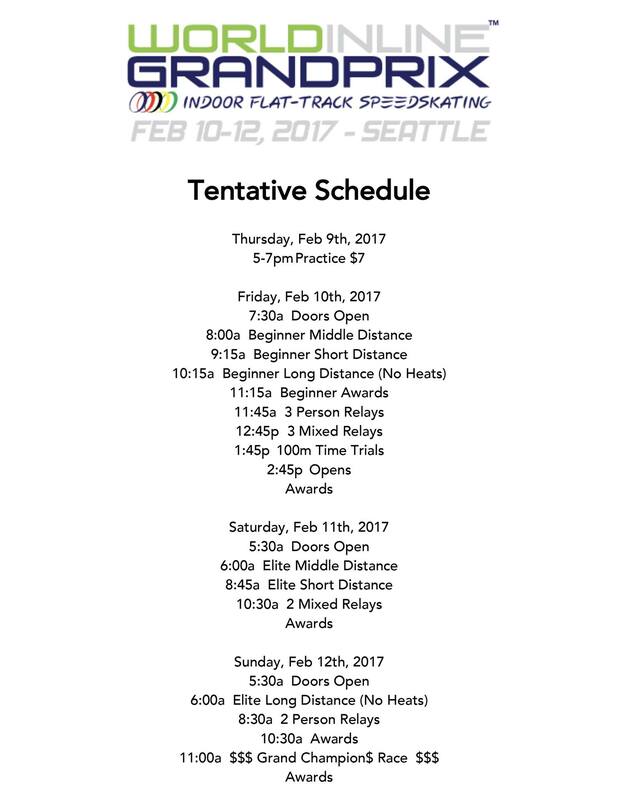 Please visit us at the World Indoor Grand Prix in Puyallup, February 10-12, 2017! This is a premier indoor only inline speedskating event open to U.S. & International athletes of amateur and world class status! DIVISION: In Novice and Elite divisions, all 3 distance races will be run. The Long distance race will be an automatic final and will be a rolling start if there are more than 8 skaters. Start position will be determined by order of points with the skater with the highest total in first and so on. Skaters without points will draw cards to determine starting position before the race. -Juvenile, and Below 10 Laps. -Elementary and Freshman 15 Laps. -Sophomore, Junior, Senior, 30 Laps. -Classic, and above 20 Laps. *Skaters will draw cards to determine position Prize money to be awarded, dictated by the number of participants. First, second, third, from Elite Freshman through Senior, qualify for the 15 lap race. $500 to the winner $200 to 2nd $100 for 3rd and all 3 placements will also will receive a premium podium medal. First, second, third, and fourth from elite elementary and below qualify for the 10 laps race. $100 to the winner and all 3 placements will also will receive a premium podium medal. First, second, third, and fourth from elite Classic and above qualify for the 10 laps race. $100 to the winner. If you skate Senior Men as one of your dvisions you are not eligible for this event. All 3 placements will also will receive a premium podium medal. Events with 3 or less entries may be ran with other events. Out of region skaters may cross team with other out of region competitors for relays.